After a long winter this year, the weather has been unexpectedly clear and unusually warm. There has not been a Memorial Day weekend like this in recent memory. Normally we are setting down for quite a bit of rain. 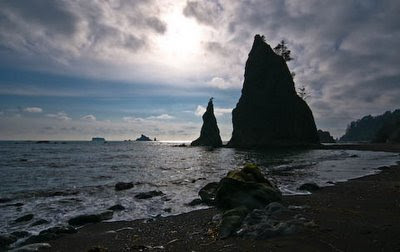 Some of the most beautiful beaches on the Washington coast are near La Push, near the Quileute Nation. 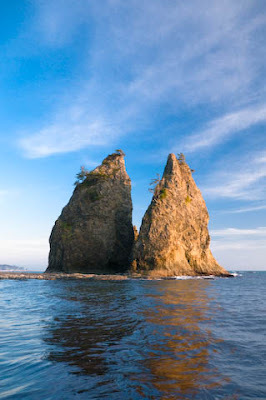 It's a 50 minute drive from beautiful Lake Crescent, our base on the Olympic Peninsula. Greeted by fantastic weather and and a light NW wind, the beach was full of Memorial Day visitors, which thinned out as I proceeded north. Ellen Creek was surprising low and easy to cross. One interesting phenomena was the complete lack of shore birds. Some were spotted on the outer rocks far offshore, but otherwise absent. A few eagles were making their way up and down the beach, but not a single sea gull. Clouds were part of the scene until near sunset, when only a few high cirrus clouds were around. Rapidly changing light was fun and challenging. The overlook at the top of Hole in the Wall was a bit thin in spots, and daunting. When the weather is not fearsome with horizontal rain, Rialto/Hole in the Wall are always a photographer's dream come true.